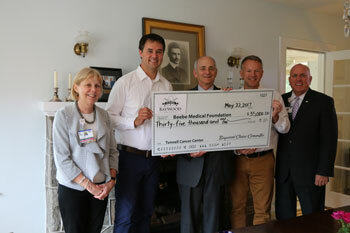 The 12th Annual Baywood Golf Classic held at Baywood Greens in Longneck on May 8, 2017 raised $35,000 for Beebe Healthcare’s award winning Tunnell Cancer Center. The popular event raises funds to further the Cancer Center’s mission of providing hope and wellness to its patients. New this year was a dinner and auction following the golf event where the community was invited to support the event. This year Baywood Greens was once again the Title Sponsor at $10,000. Mr. Bob Schnepfe, as the honorary chairman, spoke about how he underwent 14 surgeries at Beebe over the years and over that experience was always treated with the best care. Thomas J. Protack, Vice President of Development, shared, “The Tunnell Cancer Center needs to expand its services even more to meet the growing needs of our population. Beebe will be building a satellite cancer center in the south coastal region and the Baywood Golf Classic is committed to helping make that a reality.” To learn more about how you can give to your local cancer center, please call the Beebe Medical Foundation at 302-644-2900 or go to beebemedicalfoundation.org. Save the Date for next year’s Baywood Classic Golf Tournament: May 12, 2018. Photo Caption: Shown in the picture, left to right, are: Judy Aliquo, President and CEO of Beebe Medical Foundation; Robert Tunnell III, President of Tunnell Companies; Jeffrey Fried, FACHE, President and CEO of Beebe Healthcare; Lincoln Davis, Co-Chair of the Baywood Classic; and Tom Protack, Vice President of Development at Beebe Medical Foundation.